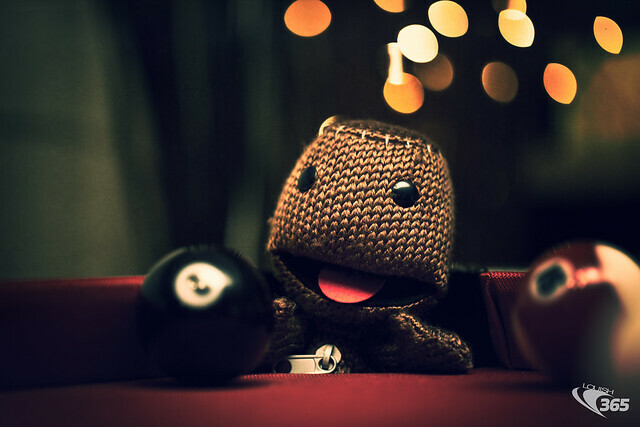 Sackboy stuck in a pool table pocket. Strobist Info: 580ex II with CTO gel facing straight up. heya!! really great cinematic style/process - would you at all share how you got this look? I think I used a vintage cross process action in photoshop, then applied some more effects in Lightroom. I probably used this action: http://www.flickr.com/groups/technique/discuss/72157601062925085/page2/ (Download the CS3 action). Apply the action to the photo, then expand the layer group it makes. You will see a magenta screen layer... I change that layer to a dark greenish/blue instead of magenta. Then in Lightroom, I probably did a little split toning with some greens.